Derry City continued their revival under caretaker boss Paul Hegarty with a comfortable Premier Division victory over Bray at the Brandywell. City made a blistering start and Mark Timlin's curling effort into the top corner was quickly followed by a Dean Jarvis header to make it 2-0. Graham Kelly slotted in for the visitors before a superb strike from Patrick McEleney sealed the points. 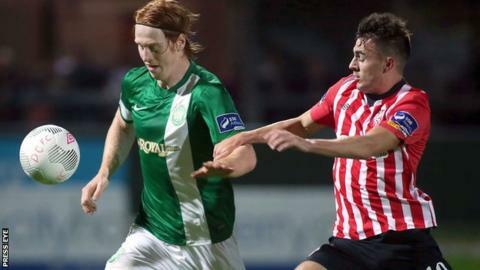 Derry move above Bray into sixth and further clear of relegation trouble. It's now seven points out of nine since Hegarty took charge and this was another impressive display. Timlin set the Candystripes on their way with a fourth-minute opener and Jarvis flicked in at the near-post from a corner six minutes later. It was pulsating opening by the hosts but Bray clawed their way back into the game when Kelly pounced on a poor pass from Ben McLaughlin before netting after 53 minutes. City keeper Gerard Doherty saved Ryan McEvoy's strike two minutes later. McEleney chalked up his first league goal of the season in style by bending the ball into the top corner after 62 minutes. Wanderers substitute David Scully hit the woodwork with his first touch as Derry secured a win which leaves them five points above the relegtion play-off spot with three game remaining.